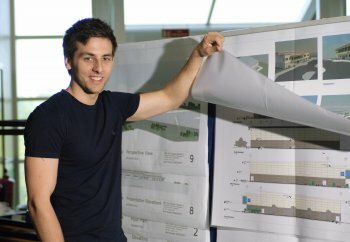 Ulster’s top Architectural Technology and Management students have been honoured at a special awards ceremony this week. Dame Mary Peters presented prizes to five students for their outstanding achievement and launched the inaugural End of Year Show at Jordanstown. The show, which featured work by second year and graduating students from the BSc Hons Architectural Technology and Management course, provided the students with the chance to showcase their aesthetical design skills and technical excellence. It also offered prospective employers, industry professionals and members of the public an excellent opportunity to identify emerging talent. David Comiskey, Lecturer in Architectural Technology and show co-ordinator, said: “This first End of Year Show provided the students with an ideal platform to demonstrate their excellence in the field of architectural technology.